If you turn north off the Mile End Road by the Regent's Canal and walk through the park, there is a short avenue of trees, like a little wood, that runs along the backs of the houses in Clinton Road. Young boys hang around on top of the mound on one side of the wood and young girls sit gossiping on the benches on the other side. 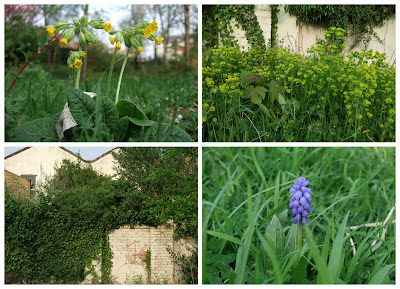 In the wood, you'll find a solitary cowslip, euphorbia robbiae and grape hyacinths. 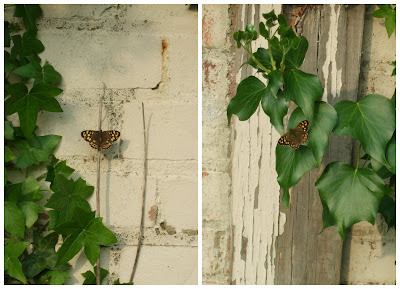 And if you are really lucky, as I was today, you'll see butterflies basking in the late afternoon sun. A blue butterfly to quick to catch. A majestic peacock lurking in the nettles. And most exciting of all, speckled woods - a male and female perhaps - enjoying the dappled sunlight and guarding their territory. I would have skipped the last few hundred yards home if I'd had the energy. As it was I just smiled to myself like a fool. You are so unbelievably good at finding the countryside in the city. Amazing. I love this blog! This post almost had me skipping. How lovely. And the fact that it's in the city makes it even better: a mini escape to the country! Spring in the West Country is always a little later than it is on England's easterly side. Nevertheless, this has been the best spring I've experienced in 11 years of living in Devon. Butterflies and fat bumble bees are hovering and the hedgerows are full of life, with clumps of primroses and other wild flowers in bloom. And the dogs have acquired their first ticks! Hastily removed, of course, and much sooner than we would normally expect to see them - so time for the anti-tick preparation . . . I love seeing your images of London - you give such beautiful glimpses into areas of the city that are totally unknown to me. Thanks for sharing them!